So, I'm in Italy! When my flatmate (and soon to become boyfriend) Will introduced me to his best friend Zack around five years ago, I never expected that his Italian family home which has been passed down from generation to generation would become one of my 'happy places' in life, a place where I feel so relaxed and content and completely at ease. My current situation as I type is one consisting of a bikini (paired with my mum's tie-dye sarong from the 80s which may displease Regina George but I am in LOVE with), an empty house (everyone has gone to the local water park but I was feeling those classic chronic illness 'you're overdoing it' warning signs so I'm holding down the fort instead) and a very kind and patient Italian handyman (whose name begins with T and is far nicer said in his accent than me attempting to spell it here). The only sounds I can hear are the hum of the refrigerator full of Birra Moretti, birds chirping as they flit between the orange trees in the garden and the fast-paced tap of my fingertips on the keyboard. The electricity is down - hence the arrival of the electrician... let's call him T - and my plans for the day have been scuppered slightly. Despite working a crazy amount recently (we're talking 6am wake-up times, still being sat at my desk at 11pm and moving to my bed to continue slogging away at my laptop until 3am) I'm still not on top of my to-do list and have taken on jobs with brands whilst on holiday, so I thought today could be a double whammy: catch up on rest after travelling (and the most stressful start to a break imaginable) and catch up on that arm-length to-do list whilst everyone else is out. After tracking down then uncoupling multiple travel adapters from their hair straightener and phone charger mates and realising that not only were they all not working but even the light switches were unresponsive, I'm now sat half in shade and half in sunshine on the veranda typing this blog post out on Pages on my rather warm and probably overheating MacBook. I've been wanting/needing to write this post for a really long time and a reason why I 'can't' has never been far away - I've got way too much work to do, my plate is already full as it is, I'm not feeling well, what if nobody understands, I don't even know what to say anyway. I definitely benefit from being 'forced' into this kind of situation: no wifi, no excuses and no people (except T, who is quietly sorting out the electricity that he installed in this very house himself years ago). Forced to be alone with my thoughts and forced to try and untangle them from the big mess they've woven themselves into in my head. I'm a classic over-thinker and it manifests itself in my life as this ugly 'thing' that only serves to cause problems where there are none, induce anxiety where there really needn't be any and ultimately, hold me back from doing what I actually want to do. And so, unsure of how to tackle it but with the best intentions of doing just that, I'm on a mission to be braver and bolder. For a really long time I've felt like time is slipping through my fingers, like scooping up wet sand on the beach as a child and trying to keep those two-handfuls worth cupped in your palms but not being able to, and I'd be lying if I said that it doesn't scare me when I look at the pages of long-gone empty weeks in my diary. I know that's mostly down to chronic illness, but I also know that the remainder of the fault lies in my brain and its tendency to doubt myself beyond all reason. 'How do I move forward from here?' is something I often ask myself, and I've decided that the answer needs to be 'by doing whatever you need to do, with whatever you've got, right now'. Physical and mental health does always come first, but going six months without blogging brings two un's to mind: unacceptable and unhappy. It doesn't sit right with me in the slightest that I've left it this long, and it also makes me sad. When I'm working I'm my best self and feel fulfilled, creative, joyful - it's only when that voice in the back of my head that relentlessly tells me 'why even try?' takes over that I end up listening to it and ultimately, regressing. It's well overdue that I loudly tell that voice where to go and just get on with being happy and following my passions and taking better care of myself. 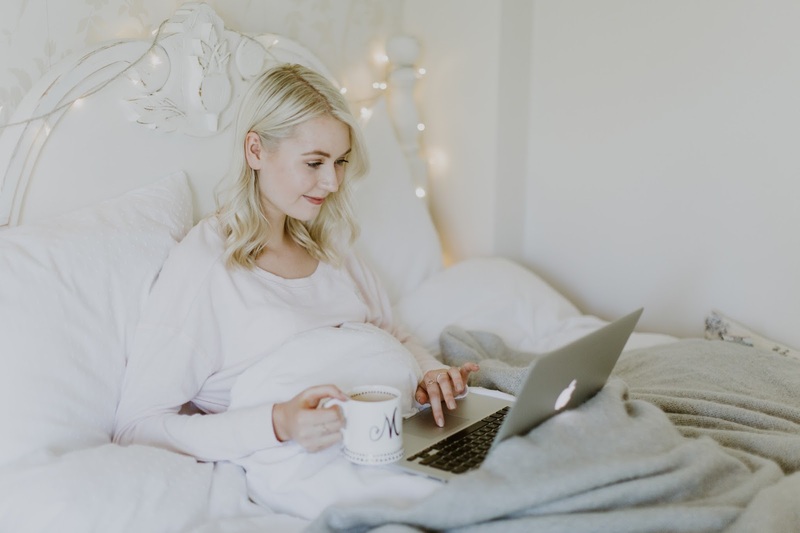 We're talking blogging regularly and giving things 100% again, without a large percentage of that number being stolen away by doubts that haven't any substance behind them. They've caused such a lack of belief in myself that at times I've simply stopped altogether (hence my lengthy absence) and I'm truly excited about the prospect of thinking 'f*** it' whilst batting away those self-destructive thoughts in favour of living my life as fully as possible. Here's to being less worried, embracing more freedom and letting 'what if' become 'oh well'. T has just popped his head around the door and given me a big thumbs up followed by a wave goodbye, so I'm gonna make myself a little G&T (it's early afternoon but I'm on my holidays) and reapply some SPF so I can get some much-needed Vitamin D whilst sticking my nose into a good book until everyone gets home. Thank you to you, lovely reader, for being patient with me and for always listening. Hope you're well, and I look forward to speaking with you a lot more often!